Lightweight, yet durable, our poly sanitary utility carts comes in a choice of 2 shelves (Model 2000) or 3 shelves (Model 3000). 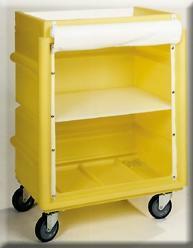 Cart is dent-proof, washable, rust proof, and comes with a top recessed tray. Cart is enclosed with a white or beige vinyl staphcheck roll-up cover which closes securely with full length Velcro strips. Body of cart available in choice of many colors. Name2 Shelf Poly Utility Cart with Roll-Down Cover3 Shelf Poly Utility Cart with Roll-Down Cover W x L x H (inches)23" x 30" x 43"23" x 30" x 52"